Hellfire: The Summoning application for Android devices is a massive multiplayer, flick-action game that can be downloaded free at Google Play Store. HellFire gamers assume the role of Gate Hunters out to destroy fiendish creatures ravaging different regions. Using fiery orbs with different elemental strengths that can critically damage and disable monstrous creatures entering through the Gates of Hell, a Gate Hunter along with his or her Allied Spirits and other fellow combatants, inflict as much damage as they can, in order to capture the diabolic creatures and destroy the Raid Boss. Hellfire: The Summoning is a creation of San Francisco-based DeNA (pronounced as DNA) West, the U.S. games development arm of leading e-commerce and mobile gaming platform provider DeNA Corp, of Tokyo, Japan. DeNA also owns the Mobage social gaming website, to which players can link their HellFire game app. App users can also link their game to their Facebook account, or simply play as a guest. As guest Gate Hunters, players are identified only through their respective HellFire player ID number. Nevertheless, even as a guest player, the installed application stores and saves every gaming progress, including the missions completed, the demonic creatures captured, the rewards received, and the evolution of their Deck characters into formidable combatant figures. Regardless of a player’s user status, the Hellfire Android game app also permits interaction with other Hellfire gamers (or Wanderers), in order to summon allies as well as to respond to requests for help in completing a mission battle. Through the Hellfire game app, Gate Hunters can likewise send or receive gifts to and from their Wanderer allies, or take them on as fellow combatants in Game Events organized by Mobage. Hellfire: The Summoning game app has over 600 hundred chapters to complete as missions by mere finger-flicking actions aimed at overpowering the invading creatures in battles. Emerging as victor in each battle enables players to unlock skills, collect magic jewels, to reinforce elemental spirits, to collect Battle potions as well as to evolve their creatures into becoming fully developed Deck minions; all of which leads to leveling up and moving forward with reinforced strength into new chapters and battle regions. 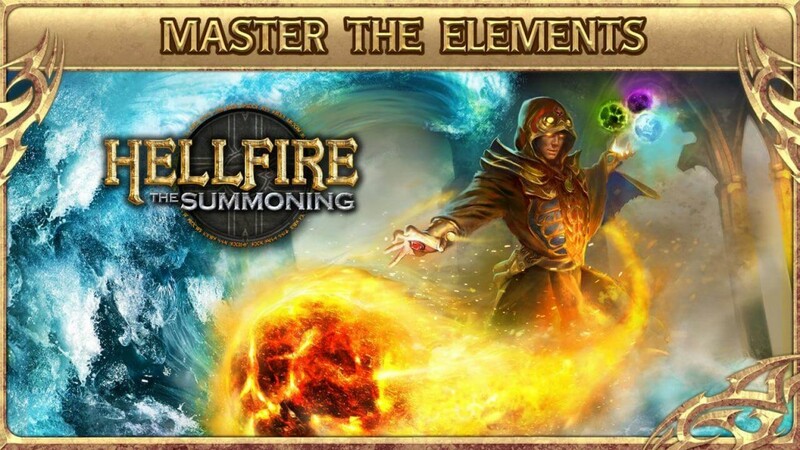 Hellfire: The Summoning game app for Android devices is a great recommend for mobile gamers who are not inclined to dabble in fast-paced game play that require executing quick and/or various gestures. Here, the gaming action does not require eloquent gaming skills, since players only need to perform flicking actions with the right amount of force in order to hit stationary enemies with powerful orbs. After all, Hellfire is, basically, an action card game that combines interactive play, where the battle energy, attack force, and appropriate elemental power of Earth, Fire, Water and Poison of one’s Deck characters and allies, could inflict the strongest damage to vanquish The Raid Boss and his demonic subordinates. However, since the game play is repetitive, and with over 600 chapters to tackle in practically the same manner, the monotony of going through the same motion could eventually wear out the excitement posed by the game. Still the game is a stress-free type of amusement. It also presents great opportunities for socializing with fellow gamers when played via Facebook and/or Mobage, since alliances are formed and for comparing and/or showing off how far and how impressive their characters have evolved.